When Cricket was about a year old, we noticed that she sometimes limped, always lifting the same back leg. 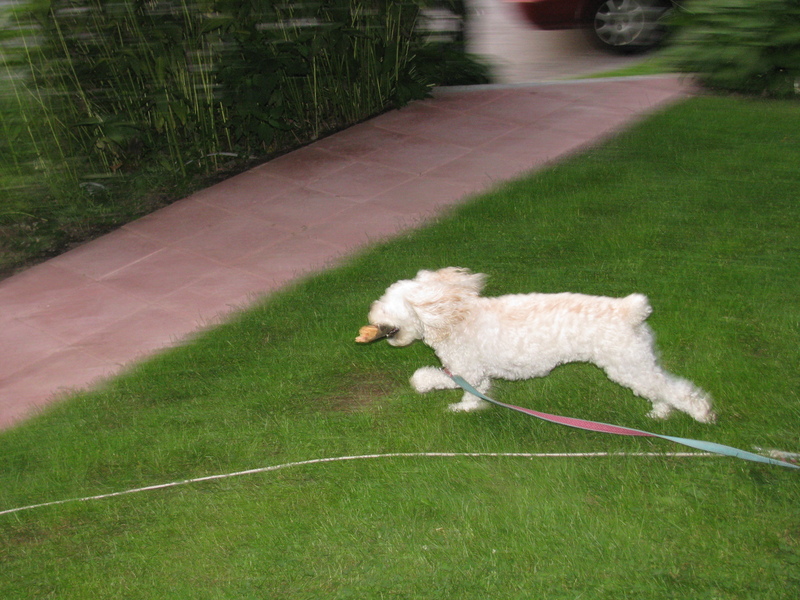 At first, I checked her foot for a burr or a nut shell stuck in her paw, but there was nothing. The limping was infrequent, at first, and then it was less infrequent. We took her to the vet and he gave her a vitamin supplement, like the one humans take for their bad knees. But it made her vomit. Cricket didn’t seem to mind having walking problems. She’d just hitch up her leg, and keep going on three legs. But we couldn’t take her on long walks anymore and she couldn’t run and she couldn’t jump onto beds or laps. People kept telling me the problem would resolve on its own, but it didn’t. The vet recommended doing an x-ray, to see the extent of the problem. Doing an x-ray meant putting her under anesthesia in the morning, then taking the scans and waiting for her to wake up. By the time we picked her up, she was dragging the vet tech down the hall to get back to us, scrabbling her toes on the slick floors, trying to go faster without much of a grip. The vet showed us on the x-rays that the ligaments holding Cricket’s knee in place were stretched like an old rubber band, and the other knee was starting to show trouble as well. It’s a problem of little dogs, he told us, that the groove in the knee isn’t deep enough so the bones keep slipping out of place and stretching the ligaments that support it until they have no spring left. The x-ray itself was scary to look at. My puppy splayed out like a dead frog in a specimen box. But, I saw the loosening tendons on the second knee and I was afraid that if we didn’t get her surgery on the first knee soon, she’d get to a point where she couldn’t walk at all. The surgery itself was only a one day affair. No eating after eight PM the night before, go in first thing in the morning, anesthesia, shave the leg, paint it with yellow antiseptic, cut it open, build a groove in the knee so it fits like a lock and key, tighten the ligament, sew with black thread. Her bare leg was grisly and yellow for a few days after the surgery. 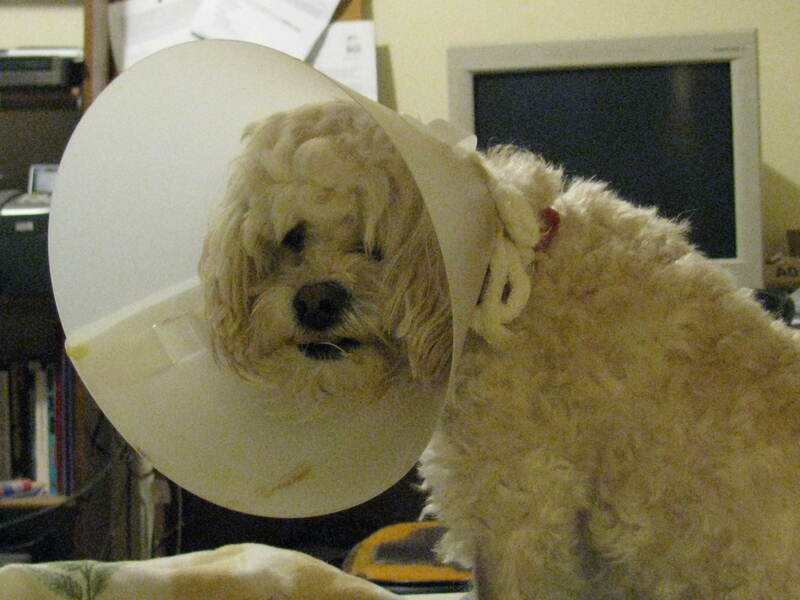 And she was drugged and woozy and wearing the Elizabethan collar to keep her from chewing at her stitches. It took about two weeks for her to start putting her foot down, then a few weeks more to build back muscle tone, because the bad leg was skinny and the good leg was getting muscle bound and tight. I started doing massage on her after her stitches were out and her bad foot was willing to bear weight. We started with gentle stretching, hamstrings, quads, but mostly hips, where there was extra strain from compensating for the weak leg. By six weeks, she was running and jumping better than she had since she was a puppy. For the next eight or nine months she was great. She got a lot of exercise and play time and I felt really good about how she was doing. But by September she was limping on the other leg. Mom wanted to wait, to see if we could get pet health insurance that would cover the second surgery (we couldn’t) and maybe look into another modality, like pet acupuncture or pet physical therapy. But Cricket was gradually limping more often and for longer stretches. When we finally took Cricket in for another x-ray, the surgery was scheduled for the following day. Mom had a bad cold and as soon as Cricket was safely home, drugged to the gills, they both fell asleep. I went in occasionally to bring peanut butter covered pills for Cricket and Robitussin or soup for mom. I carried Cricket outside to pee and deposited her back up on the bed. Cricket’s knees are perfect now. The only sign of the surgery is that her knees stop her before she can straighten her legs out fully, but it’s barely noticeable. Whenever I think, maybe we shouldn’t have spent the money or put her through the pain of surgery, I just have to watch my mother take Cricket out for her morning joy run across the front lawn. It’s a reason to wake up each day, for all of us. 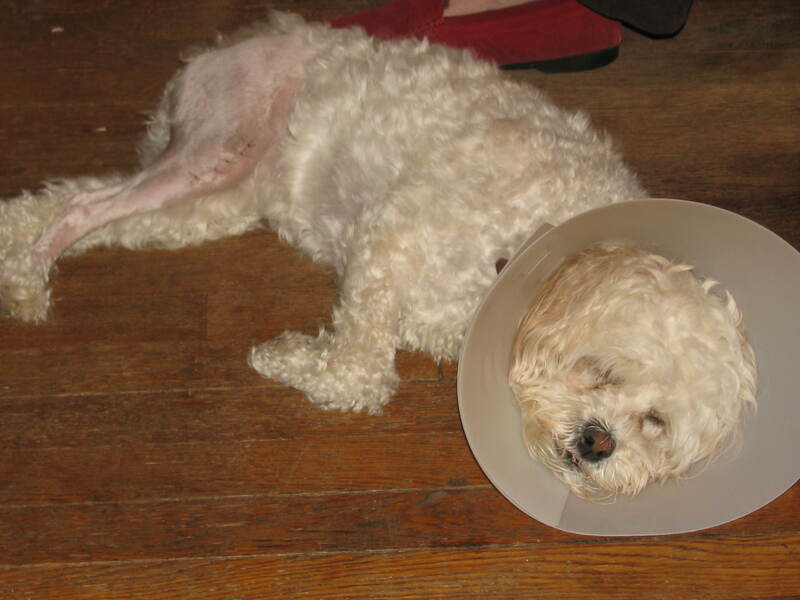 Posted in dogs, memoir and tagged dogs, joy, jump, knee surgery, run, walk, x-rays. Bookmark the permalink.